The world is getting smaller. Cutting ourselves off from Christians around the world is not an option. In many countries, the rise of persecution fuels concern over the safety and rights of believers, while other nations that used to be closed to the Gospel are seeing unprecedented numbers of conversions to Christianity. As global ambassador of the World Evangelical Alliance, what Dr. Brian Stiller experiences on the ground in these nations is often counter to our impressions. As he listens to people's ideas and observes their innovations, he invites you to see and hear what he does. 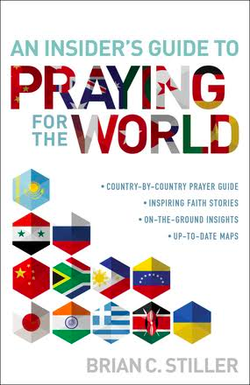 An Insider's Guide to Praying for the World includes country-specific insights calling us to a deeper understanding of the Christian church and witness. Each chapter also provides prayer challenges that come from believers in the country as well as maps and sample prayers. Nations from every continent are included. Be inspired to learn about other lands--both familiar ones, such as China and Kenya, and ones you may know very little about, like Sri Lanka and Bangladesh. But more important, take part in God's work by praying for the real needs of your brothers and sisters around the world.